Preheat the oven to 200C/180C (fan)/Gas 6 and place a baking tray inside. Put the chocolate in a heatproof bowl and place over a pan of gently simmering water, without letting the bowl touch the water, until the chocolate is almost completely melted. Carefully remove from the pan and leave to stand to finish melting, stirring occasionally until smooth. Put the butter, ground almonds, sugar, flour and eggs in a large mixing bowl and beat with an electric whisk until smooth and fluffy. Alternatively, put in a mixing bowl and beat with a wooden spoon. For the pastry, press the sides of the pastry block in a little to help form a rounder shape. Roll out on a lightly floured surface until around 5cm/2in larger than a 26cm/10½ fluted flan tin and 3mm thick. Lift carefully over the rolling pin and drop gently into the tin, pressing firmly into the corners and sides. Prick the base lightly with a fork. Trim the edges with a sharp, horizontally held knife. Spoon all the almond mixture into the tart, working it around the outside before working towards the middle of the pastry case. Drop spoonfuls of the melted chocolate on top and draw the tip of a knife through the mixture to lightly marble. Put the lemon juice in a large bowl. Peel the pears and cut into quarters. Remove the cores and discard. Toss the pears with the lemon juice to help prevent them discolouring. 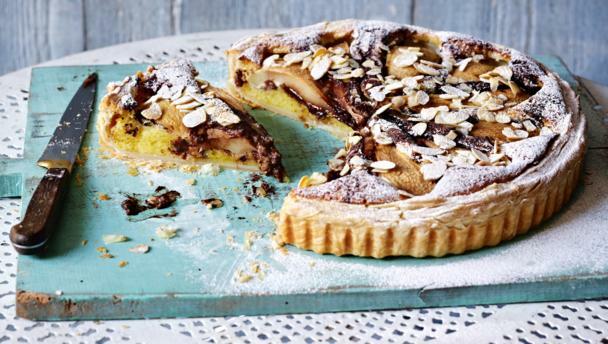 Arrange the pears around the tart, cut-side down, with the pointy ends towards the middle, pressing gently into the almond batter. Bake on the baking tray in the oven for 30 minutes. Pull the oven shelf holding the tart out a little way and very carefully scatter over the flaked almonds. Reduce the oven temperature to 180C/160C (fan)/Gas 4. Return the tart to the oven for a further 25-30 minutes, or until nicely risen. The filling should also feel firm to the touch. If the tart is beginning to overbrown towards the end of the cooking time, loosely cover with a piece of foil.